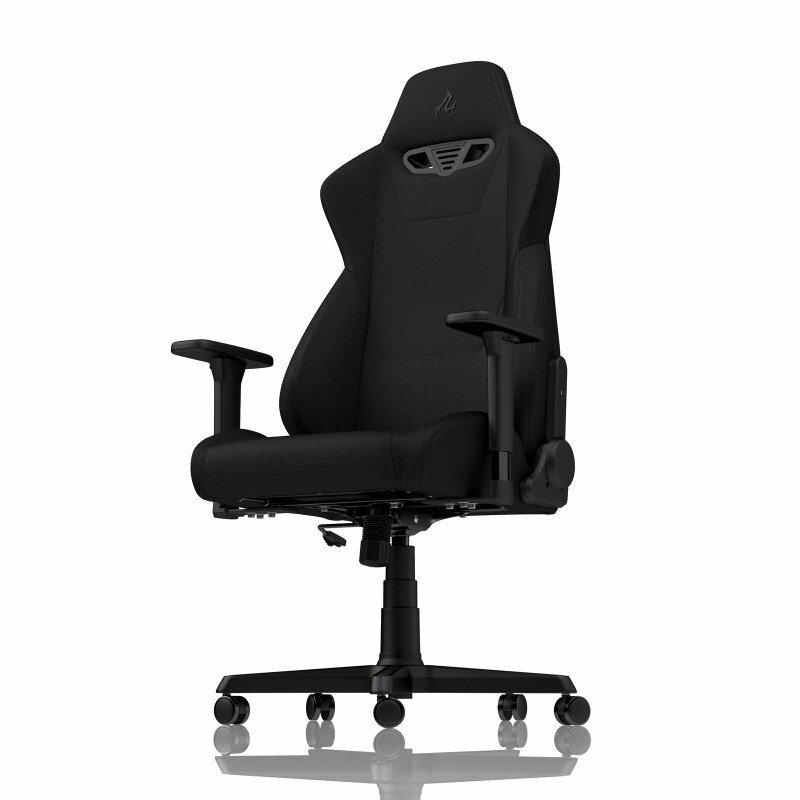 EXDISPLAY Nitro Concepts S300 Fabric Gaming Chair - Stealth BlackSorry, this product is currently out of stock. Nitro Concepts presents the S300 series, an impressive gaming chair that combines optimum ergonomics with an extravagant racing look in bright colours. In times of RGB-lit computer hardware or meticulously colour-coordinated furnishings, it is of course becoming increasingly important to have the matching office chair to enable users to precisely tailor the overall appearance. Nitro Concepts S300 is therefore the ideal office chair for lifestyle-conscious users who want to combine comfort with exceptional ergonomics, functionality, a pleasant fabric cover and a chic design. The upholstery of the S300 series is made of open-pore and deformation-resistant cold foam, which has been specially optimised for durability by means of its superior density. The chair is therefore not only particularly breathable, but also ensures its capacity to maintain its shape over time. The typical appearance of a racing seat is retained, which is achieved by the sporty shell-style design. To maintain the impressive design of the S300 series for as long as possible, a sturdy steel frame is used as the foundation for the outstanding upholstery. Additionally the gaming chair's premium materials ensure that noises such as squeaking or creaking and rapid wear and tear are a thing of the past. The combination of excellent German engineering skills and high-precision mechanical manufacturing allows a reliable and durable construction. Of course Nitro Concepts' S300 series offers a wide range of customisation options, which means that the ergonomics of the gaming chair can be tailored to the individual user. The long-life safety class 4 gas lift allows the chair to be adjusted by 13 cm in height for example, and this corresponds to a maximum seat height of 48 to 61 cm. Furthermore the integrated rocking mechanism allows the seat to rock backwards by up to 14 degrees. However that is not to say that achieving a relaxed sitting position requires the rocking mechanism to be used, the backrest also offers further options for adjustment. The backrest can be positioned at an angle of 90 to 135 degrees, which means that it is even ideal for a quick nap in between rounds. Not to be forgotten, of course, are the two comfortable and ergonomically supportive cushions for the neck and lumbar area, which are included in the delivery. Nitro Concepts decided to integrate flexible 3D armrests into the armrests of the chair which, thanks to their extensive adjustment options, mean they blend in perfectly with the sporty aspirations of the gaming chairs as a whole. They can be easily adjusted in height, both to the right or left and in terms of the angle of the supporting surface. This means that every user will be able to find the optimum setting and adapt it to his or her needs. The base utilised here is a durable nylon base complete with five arms and whose look is accentuated by the addition of matching coloured accents this is rounded off with the addition of silent castors. The 50 mm castors consist of a hard nylon core with a soft polyurethane coating. This means that the rollers not only run particularly smoothly, but that they are equally well suited for both hard and soft flooring. The complete base including steel frame and safety class 4 gas lift more than meet the requirements for supporting a maximum load of up to 135 kg.